Like most Havana days, Wednesday, Jan. 21, 1998, was beautiful. 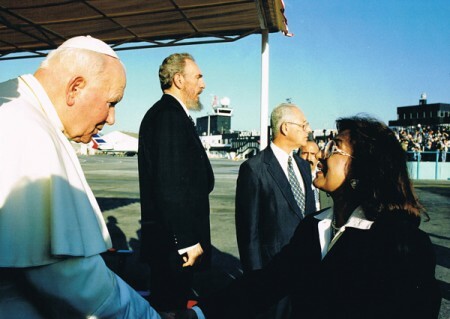 The sun was at its zenith as we gathered on the tarmac to await the arrival of Pope John Paul II, who was making his first pastoral visit to Cuba. I was a career diplomat stationed in Havana, the Charge d’Affaires of the Embassy of Guyana. I had made similar trips up to Jose Marti International Airport whenever a foreign head of state was visiting. This was a very small part of the job we did as diplomats, but sometimes, as on that day, it took on new meaning. This, of course, was not a normal visit by a head of state. The Catholic Pope, while also head of the Vatican, was the symbol of Christian faith to hundreds of millions around the world. His visit was a highly anticipated event both for the millions of Cubans who still considered themselves Catholics, despite the challenges they faced, and for international observers. It had attracted criticism from those who felt that human rights violations on the island should not have been rewarded by a papal visit. However, this Pope was obviously not easily deterred from visiting his flock. In his time he had visited a number of dictatorships and had left raised expectations in his wake that had eventually resulted in change. On a personal level, as a Lutheran, I felt the historical connection of my faith with what the Pope represented to Christians of all denominations, and I had also been fascinated by the way John Paul II had brought the papacy to the global public. From the time of his election in 1978, this energetic and charismatic but down-to-earth leader had become a media star, a celebrity Pope whose international visits generated massive crowds and emotion. I witnessed that in person in 1979 when the Pope made his first visit to the United Nations General Assembly in New York. I was a young Foreign Service officer and a member of Guyana’s UN delegation that year. I remember the excitement in the auditorium as we listened to him make his speech. Looking back, I have often wondered how much influence Cal Lutheran, where I arrived in 1965 as one of a handful of foreign students, had on the choices that led me to places such as these. I have no doubt that the formation I had, the strong Christian values I consolidated, the self-confidence, the feelings of self-worth and dignity I developed within an environment where learning was easy and where personal growth was possible – all were tremendous assets to me in the years that followed. The experience was more than just academic. I sometimes thought of the campus as an oasis of tranquility in the California of the late ’60s. And I remember the kindnesses of many people who reached out to a young woman from another country and made her stay memorable. At about 4 in the afternoon on that warm January day in Havana, the Alitalia plane came into view. Flags of the Vatican and Cuba were hoisted. The plane landed, and, after what felt like an eternity of waiting, His Holiness appeared at the door to a collective gasp and then spontaneous applause. He was old now, he was ill, and this was his 81st international trip as Pope. He managed on his own to make it down the stairs. I recall my struggle to control a range of emotions as I watched the ceremonial proceedings and waited my turn in the long line of dignitaries of church, state and the diplomatic corps. I was actually going to meet him! I told myself that I was now a seasoned diplomat with more than two decades of experience and should behave accordingly. Seeing others who were completely overcome with emotion as they greeted the Pope did not help any. Later, the Papal Representation in Havana presented me with a photograph of the encounter that told its own story. I had that photograph enlarged and framed, and it now occupies a prominent place in my home. Every time I look at it, the only description that comes to mind is that it was a brief but blessed encounter, and one of the high points in a fortunate career. Rita Ramlall is a retired Guyanese diplomat now living in Canada. Entering California Lutheran College with the Class of 1969, she graduated a year later than expected after switching her major from “pre-med” to the new program in Latin American Studies. Birds, cameras and travel go together. It’s science.